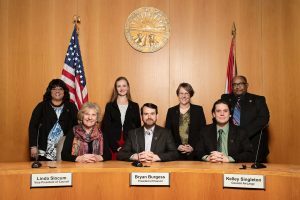 Oberlin City Council is the legislative branch of City Government and operates in accordance with the provisions of the Charter of the City of Oberlin and the Ohio State Constitution. Seven members of Council are elected at large by Oberlin residents in a non partisan election, for a term of two years. Members shall serve concurrently and no member shall be elected to more than five (5) consecutive terms. Council members are part-time civil servants who do not maintain offices at City Hall but, rather, serve their constituency through personal contact. Those who would like to relay a question, comment or concern to Council may do so at the meetings or by contacting them. See below for more information on how to contact your Council member. Oberlin City Council meetings are held at 7:00 pm on the first and third Mondays of each month, with the exception of the months of July and August, during each of which months Council may at its discretion dispense with one of its regular meetings. Meetings are held in City Council Chambers located in City Hall, 85 South Main Street. All meetings with the exception of executive sessions shall be open to the public in accordance with State law. See the City Calendar for the dates and times of meetings. A guide for City Council Members: City Council Orientation Handbook please refer to other documents such as the Oberlin City Charter, City Council Rules and Roberts Rules of Order.